"Elearning authoring tools"adaptive elearning designAdobeAdobe Captivateadobe captivate draftAdobe Captivate2017blogconverting PowerPointMS PowerPointPowerPoint RoundtrippingTips and TricksWhat's new? SInce 10 years I try to broadcast the same message over and over again: Powerpoint is a presentation tool, doesn’t matter how many people claim it to be an eLearning tool. A presentation is meant to be delivered by a presenter, to reinforce what he is telling, and perhaps also to be able to create handouts. A presentation is essentially a 1 to many transfer of some ideas/knowledge about a subject. Creating an efficient presentation is a great skill, but many presenters lack that skill. Being comfortable with presenting (even without a tool) for a big audience helps. eLearning assets have a totally different goal: they are meant to be ‘consumed’ by a learner personally, should adapt to the learner’s rythm, giving him as much control (and personalisation) as is possible. Skills required to create that type of content are totally different: being a trainer, a teacher, a coach helps but since in most cases IRL contact is not possible, eLearning requires even more. The only common feature to both goals is design, but that is IMO overrated. Storyboarding will also be totally different for a presentation than for good eLearning. 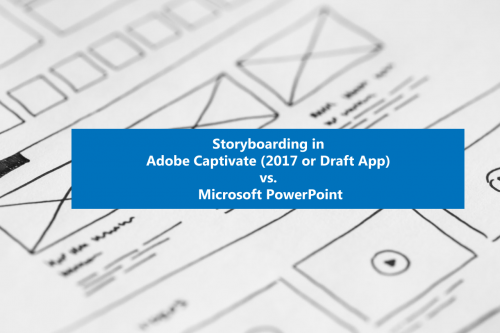 I do use Captivate also for presentations, because I believe that an interactive movie after the presentation is more efficient than static handouts. Myself I mostly use a mindmapping tool or a flowchart tool (Visio). I may write out text for VO, but not always create a storyboard because I find it sort of restricting my workflow. PowerPoint can be an elearning tool if you know how to use the tool. I’ve created elearning via PowerPoint and VBA that was completely independent of PowerPoint, meant to be consumed by an individual, had knowledge checks, quiz, checks to ensure a user did not just click through the content, and produced three certificates (personal, manager, and HR) at the end with email capability. For those of us using ADDIE (or a flavor of it), Design is a very big part of the process. It all depends on the tool you are familiar with and your level of knowledge with that tool. Just FYI, I have been teaching Powerpoint. Even with VBA I never could reach the same level of interactivity as with a real eLearning tool. However I totally agree with your sentence: ….”all depends on the tool you are familiar….’. My reluctance towards PPT may be due to the amount of bad presentations I had to watch. I have used much better presentation tools (Harvard Graphics, Freelance Graphics) before they were killed by MS.